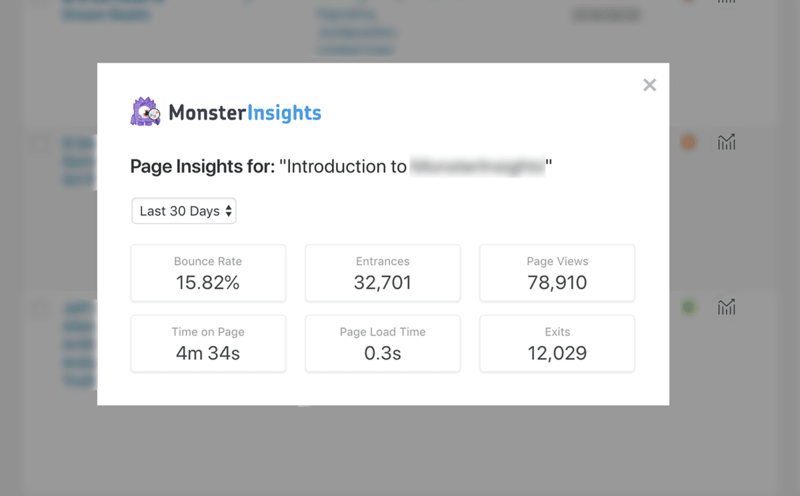 The MonsterInsights Page Insights addon allows you to see stats for each individual blog post or page right inside your WordPress dashboard. Want to see stats for each individual blog post or page in WordPress? Our Page Insights for WordPress allows you to quickly view important metrics for your individual blog post or page right inside your WordPress dashboard. Once enabled, you can see the Page Insights column on your Posts / Pages screen. Clicking on the icon will open a popup window with stats for the individual blog post or page. Currently, the page insights feature allows you to quickly view important metrics like: new visitors, page views, bounce rate, time on page, page load time, and exits from this page. Knowing the above stats for each individual article will help you see which articles are performing the best and also which articles have leaks that need to be plugged. Get Page Insights and grow your traffic, engagement, and conversions with confidence. Get started with MonsterInsights today!